Leaving the party is a personal rejection of Donald Trump, but it is also a rejection of today’s GOP orthodoxy and the partisanship it craves. You can’t be never-Trump and be a Republican. That’s the clearest and most unequivocal conclusion to which I’ve regrettably, but genuinely, arrived. And it took something more than politics to finally convince me that the fight for the heart and soul of the Republican party has been lost to darker angels — to a darker leader. My wife and I are celebrating the imminent arrival of our first child, a daughter. Through no choosing of her own, our little girl will inevitably be born into a political household, a household in which her mom and I hope to live the political and moral principles we believe are right, and to prepare our daughter to someday make her own informed choices. Three years ago, I was a sitting Republican member of Congress who took to the House floor and called on then-candidate Donald Trump to drop out of the presidential race over his proposal to ban immigrants and asylum-seekers based on their religious faith. I had not previously supported Trump during the presidential primary, nor did I ever come around to supporting his candidacy or his presidency, despite the overwhelming majority of Republican leaders who have dutifully fallen in line behind the brash, irreverent and often offensive leader of the party. Three years later I find myself fully immersed in a dwindling coalition of Republicans often referred to as never-Trumpers. That is, I was immersed in that coalition — last month I came to the conclusion that it was time to finally leave the Republican Party and registered with no party affiliation. My reason is simple: Never-Trumpism must also be a rejection of today's GOP orthodoxy, not just the president himself. Three years into the cultural and political phenomenon that is Donald Trump, we each can recall in vivid and anxious detail clear moments of his personal and presidential failings. This is a man who is well known for his misogyny, his equivocation and manipulation on matters of race and racial justice, a man largely unable to tell the truth or accept accountability, a man of little intellect, conviction or ideology who is often willing, and at times seemingly longing, to display his lack of temperament and fitness on the world stage. The verdict is in, and it is clear. You either support Trump or you oppose him. You either find valor in his no-nonsense, boorish approach, or you find weakness and shamefulness both in the man and in the image he projects on the nation. But Trump did not, as many have suggested, merely hijack a political party in order to rise to the most powerful position in the world. He walked right through the front door into the welcoming arms of a coalition that was eagerly awaiting his leadership and his ascendency, a coalition that had long since abandoned conservatism for the more satisfying ideology of angry populism. It was a Faustian bargain. He used the GOP for his own purpose, and the GOP used him for its own agenda in return. Trump did not, as many have suggested, merely hijack a political party in order to rise to the most powerful position in the world. He walked right through the front door. In the decade that has produced Republican voices like Sarah Palin, Sean Hannity and others, Trump cemented within the party a culturally lethal combination of sheer ignorance and raw indifference to responsible policy. Together with legislative and industry insiders looking to unapologetically advance their own priorities and those of deep pocketed corporate interests, the Republican party willingly, knowingly and deliberately shaped itself in Trump's image. Thus, what was once a party that embraced classic conservative political and economic theory — and believed this ideology was a way to empower Americans — has instead evolved into a callous political coalition willing to leave some of the most vulnerable behind. The examples are many. To abandon any legitimate attempt to solve pressing healthcare problems for the American people simply because of entrenched opposition to Barack Obama displays not only heartless indifference, but intellectual bankruptcy. To condone the separating of children and parents and the detention of youths seeking freedom invalidates any rational positing that a party cherishes and values human life. My leaving the party is a personal rejection of Donald Trump, but it is also a rejection of today’s GOP orthodoxy and the partisanship it craves. To knowingly overlook racial animus and the stoking of racial division undermines not just a party’s moral authority but the personal integrity of those who support it. To ruthlessly pursue economic policies that exacerbate class disparity and needlessly limit opportunity for the least fortunate among us, while enriching the wealthiest and rewarding large donors, reflects not a spirit of humanity, but a spirit of both greed and spite. To speak of personal responsibility but laughingly cast our own generation’s debt obligations upon our children is not leadership. It’s selfishness. These are ideological reflections not of Donald Trump's governance, but of the Republican party under today's GOP leadership. Trump has given free rein to these elements within the party that in the past had remained at least tempered by more sensible voices. But he did so in coordination with long-standing traditional Republican leaders, who despite notionally speaking to broad concerns of tone and tenor, eagerly accepted his leadership as a means to an end — a way to accomplish an economically and culturally divisive Republican agenda focused on self-enrichment and a disdain for the natural diversity of the nation. My leaving the party is thus a personal rejection of Donald Trump, but it is also a rejection of today’s GOP orthodoxy and the partisanship it craves. Though parties have their important and proper roles, we know that George Washington warned against their contribution to factions, and two centuries later Barack Obama was still warning of the din of partisanship. To my Republican friends who will doubtless respond to my criticism by pointing to shortcomings within the Democratic party, I would simply suggest you direct those complaints to Democratic party leaders. It is not a political affiliation I have ever had, and therefore not one with which I have sufficient authority to discuss. To those on the left who ask why I did not leave sooner, I would say this: I’m glad that I fought for what I thought the Republican Party could be and should be. In the example set by the work of my wife and I within the GOP, I hope our daughter will see the importance of fighting for something you believe in. And from our decision to eventually leave the party, I hope she learns that there are fights from which wiser women and men walk away. This is one of those fights. The question for each of us is: What emerges from this most consequential political moment? It is as much a calling as it is a question. For me, I look forward to a renewed faith in both our country and our political system as a member of a coalition of those not affiliated with any major party and willing to work constructively with thought leaders on either side of the political spectrum. In the end, we each will be remembered for the example we leave for others. It's a choice over which we have complete control. I'm confident in my decision — are you in yours? 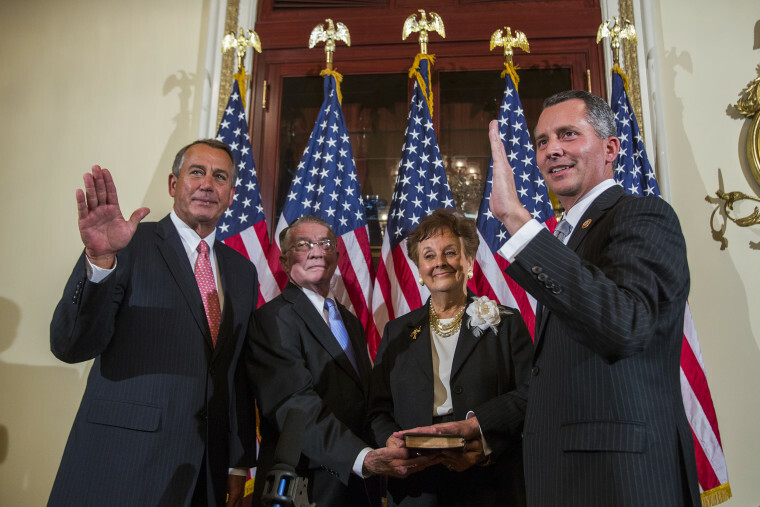 Rep. David Jolly served in the United States Congress from 2014-2017. He represented Florida's 13th district.